When you go to Lala-Oopsies™ Land you’ll meet Princess Ballerinas, fairies and even mermaids! So you know what to say, here’s some useful info below on some of the mermaids you might meet! Have fun with all the Lala-Oopsies™ in the new film Lala-Oopsies™: A Sew Magical Tale – The Movie out on DVD and Download from 27th May! 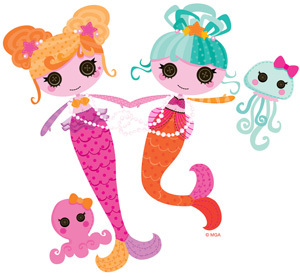 Mermaids can be found in Lala-Oopsies™ Land swimming in the strawberry milk that surrounds the floating islands. And if you see them don’t be shy because they love making friends! If you see a mermaid with orange hair, that’s Opal! She lvoes adventure and often leaps before she looks! Then there’s the blue-haired mermaid with the orange striped arm – that’s Water Lily! She’s a lot more careful than Opal, but you’ll often see her having lots of fun with her pet jellyfish. Lala-Oopsies™: A Sew Magical Tale – The Movie out on DVD and Download from 27th May! Click here to find out more and order your copy!